A final year student of the Department of Nursing, College of Medicine, University of Maiduguri, Fatimah Abu, is in a critical condition at the University of Maiduguri Teaching Hospital, Gwange, after she was reportedly robbed, r*ped and bathed with chemicals by suspected robbers. 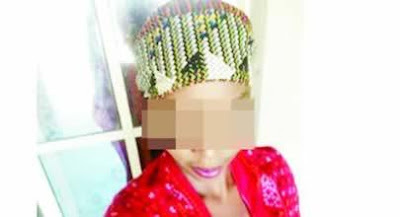 It was learnt that the 24-year-old had boarded a tricycle at her school’s park on Friday en route to her residence when she was abducted by the men. The two robbers allegedly took turns to r*pe her in a bush and poured chemicals on her body. The chemicals reportedly caused blisters and burns on different parts of her skin. According to The Punch, the victim’s purse, containing her phone and some money, was taken away by the suspects, who dumped her by the roadside. The victim, upon regaining consciousness, reportedly flagged down a tricycle rider, who took her to the Dandal Police Station. The police then rushed her to the state specialist hospital, Maiduguri. The victim’s friend, Musa Alkali, said she could not identify her assailants. He said, “She is a 500 level student of the Department of Nursing, UNIMAID. She lives at the Federal Low Cost area and had boarded a tricycle from the university’s park. “That was the last thing that she said she could remember. She just woke up around a cemetery in the Gwange area with acid on her face. Her legs and different parts of her body were affected. “She stopped a Keke Napep (tricycle) rider who took her to the Dandal Police Station. She managed to come down from the tricycle and collapsed. She was taken to the state specialist hospital from where she was transferred to the UNIMAID Teaching Hospital. Alkali said while he suspected that the attack might not be the handiwork of ordinary robbers, he could not tell if Fatimah had any problem with anyone. He noted that the school’s park was usually crowded around the time she boarded the tricycle. “We hope that when she recovers, she will give further information on the attack,” he added. Alkali told Punch that Fatimah, who hailed from the Biu Local Government Area of Borno State, was in dire need of medical assistance as the family could not afford to raise money for her treatment. The victim’s sister, Zara, while wondering what could have triggered the attack, said that Fatimah was an easy-going woman. She also maintained that acid was poured on her. “She is my younger sister and I have been sleeping at the hospital since she was admitted. She cannot talk much because the acid affected her mouth as well. She does not know those people (responsible for the attack). She is innocent. She does not quarrel with anybody. Even her classmates testified to it,” she said. Zara urged the police to identify, arrest and punish the culprits. The state Commissioner of Police, Damian Chukwu, told Punch that acid was not poured on the victim, saying the police were on the trail of the suspects. He said, “On the day of the incident, she said she went to a bank for a transaction and after she was done, she came out and boarded a tricycle. She said there were two other passengers in the tricycle and she sat in their midst. “She said along the way, one of them came down, remaining her and another passenger. She said suddenly, the passenger brought out an handkerchief which he started waiving. She said she suddenly lost consciousness.